Years ago, Paula and I flew all the way to San Diego to a writers’ conference that featured Elizabeth George as its keynote speaker–and she didn’t disappoint. But the other reason we were excited about the conference was because an expert was going to explain how to use enneagrams to develop characters in stories. In theory, enneagrams assign different personality types a number; and that number shows the strengths and weaknesses the person will have. For example, a type 1 personality is “The Reformer,” like Eleanor Roosevelt or Miss Marple–principled and self-controlled–a perfectionist. Their idea of how to get love depends upon if they do everything right, exactly right. Their sins if things go wrong? Anger or being too self-righteous. There are 9 numbers for 9 different personality types. Paula and I took the quiz the speaker gave us, and I got a 5, the investigator–like Sherlock Holmes. Isolation can be good, to withdraw and think. In excess, some fives totally pull away from society, like the Uni-bomber–so you’ve been warned. Type fives’ typical resonse to something new is “Let me think about it.” Paula tested as a 7, the enthusiast, like James Bond. And she still loves new experiences. Sevens need high stimulus and want to keep their options open. One afternoon, we attended a panel that wasn’t what we’d expected it to be. Paula turned to me and said, “Let’s get out of here. We can drive into town and get some wine.” I said, “Let’s think about it.” And we looked at each other and laughed. We’d just verified our numbers. But Paula won, and we took off, and I was happy we did. I used to use enneagrams to develop character wheels because the numbers made me think about both the strengths AND weaknesses of my characters, along with what they’d have been like as children. Since I plan to focus more on relationships in my new romance, I dug out my old book The Enneagram Made Easy by Renee Baran and Elizabeth Wagele to chart wheels again. I bought it a LONG time ago, and I found free downloads on the internet, but a few warned that they were unsafe–so I’m not adding a link. I don’t want anyone to catch a virus from my blog:) But they’re out there, if you’re tech savvie and stay safe. Anyway, if you’d like to find your number, you can try an online quiz: http://www.enneagramquiz.com/quiz.html. If you’re curious, there are a few different enneagram sources online. And who knows? Enneagrams might help you look at your characters in new and different ways. 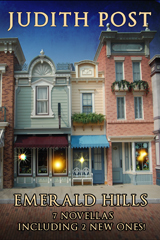 FYI, My new novella bundle, Emerald Hills, is online now. 7 novellas in one collection-http://amzn.to/1oBHaNp. A charmer…. A good thing since he’s going to meet his dream girl soon, isn’t he? I’m guessing he craves success, too. Took the quiz and I’m a 9 with a 1 wing … The Dreamer. 🙂 I’ll go with that. My second daughter’s a seven. A great number!